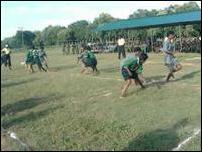 The final rounds of the sports competitions among the women’s brigades of the Liberation Tigers of Tamil Eelam were held Tuesday afternoon by the Tamil Eelam Sports division, and the LTTE’s leader, Mr. V. Pirapaharan, senior commanders, special commanders, commanders and political leaders, cadres and supporters, attended the meet, sources in the Vanni said. The competitions are held to mark the Tamil Eelam women’s day and the 16th anniversary of the death of Second Lt. Malathy, the first woman cadre of the LTTE to die in combat, the sources said. In the first event Tuesday, senior commander for the Eastern region, Col. Karuna, hoisted the Tamil Eelam national flag. Thereafter, the final round of the Volleyball competition between the Anparasy brigade and the War Strategy division was held. The event took place amid the loud applause of the spectators. The Anparasy brigade won the first place in Volleyball. 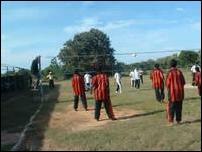 Then the traditional ‘Kilithattu’ game opened between the Sothiya and Malathy brigades. In a tight competition, the Sothiya brigade emerged the winner with 11 points vs. 10 points for the Malathy brigade. In the fast-eating competition, which kept the audience on their toes, the Sothiya brigade won the first and second places, while the Anparasy brigade came in third. 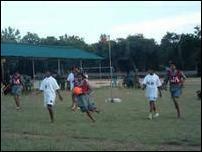 In the Netball competition, the Malathy brigade won with 37 goals against the 18 goals of the Anparasy brigade. All final rounds were completed and the meet concluded at 7 p.m.